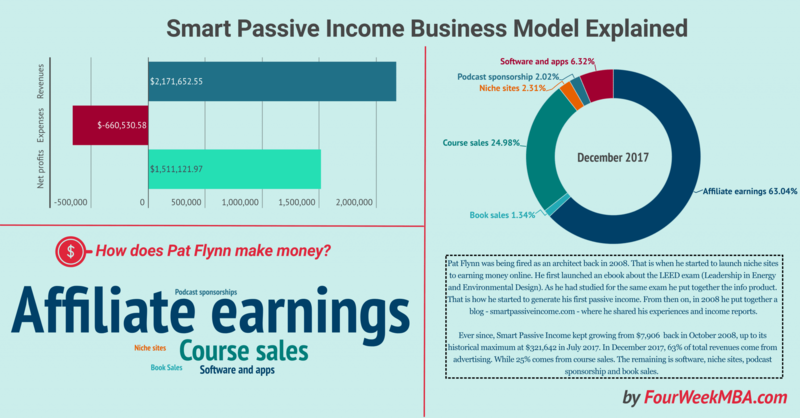 Pat Flynn, creator of Smart Passive Income makes money by affiliate marketing, book sales, and course sales. He has also built niche sites that generate passive revenue streams. Additional income comes from podcast sponsorships, software, and apps. The smart passive income model purpose is to automate revenue generation. How much money does Smart Passive Income make? August 2010: Create a win-win for everyone! March 2017: It all starts with believing in what you do! Pat Flynn was being fired as an architect back in 2008. That is when he started to launch niche sites to earning money online. He first launched an ebook about the LEED exam (Leadership in Energy and Environmental Design). As he had studied for the same exam, he put together the info product. That is how he started to generate his first passive income. From then on, in 2008 he put together a blog – smartpassiveincome.com – where he shared his experiences and income reports. As of the year ending in December 2017, Smart Passive Income generated $2,171,652. Most of the revenues come from affiliate marketing; while the remaining are related to selling Smart Passive Income Info products. It also recently launched a software product called Smart Podcast Player, which in December 2017 generated $9,646.70 in revenues. I needed an easy way to organize my study notes, so I bought the domain intheleed.com and started a blog. Each entry I made explored a topic that was likely to come up on the exam. Back in 2008, Pat Flynn was working as an architect for a firm in San Diego. He was laid off, so he had to figure out right away how to make money as he was also about to get married. He started a niche site, based on the LEED exam. He realized right away that to make money online; he had to bet on niches. In October 2008 he started to share his experiences on smartpassiveincome.com. Ever since, Smart Passive Income kept growing from $7,906 back in October 2008, up to its historical maximum at $321,642 in July 2017. In December 2017, 63% of total revenues come from advertising. While 25% comes from course sales. The remaining is software, niche sites, podcast sponsorship and book sales. The logic behind a passive income business is slightly different from a traditional company. In fact, a passive income business is based on automating most of the processes until the maintenance required to run the business is minimal. Also, a passive income business can also be defined as a sort of lifestyle business. Therefore, it starts from defining the desired TMI (total monthly income), set up a digital business to meet those goals. In short, the passive income business caps its growth to meet the desired lifestyle. There are a few ways to monetize an online business and affiliate marketing if done well can make you wealthy enough to give you the freedom to do what you like without worrying too much about the future. Today I want to show you the most exciting case of affiliate marketing: smartpassiveincome.com. Created by digital entrepreneur Pat Flynn, a former architect in San Diego, his story is incredible as he started from scratch. Now his main website generates anything from a hundred up to over three hundred thousand dollars on a monthly basis. How did he do that? Let’s dive into Pat Flynn’s story. Your best email below to get great content straight to your inbox! Back in October 2008, Pat Flynn. An architect from San Diego, laid off by his employer decided to build an online business. After a few successful attempts he put together Smart Passive Income, a website focused on how to make money online. Ever since Pat Flynn shared his income report and how he went from $7,906.55 in revenue back then to hundreds of thousand dollars a month. How did he start to make money? Pat Flynn started from the launch of an ebook about the LEED exam (Leadership in Energy and Environmental Design). As Pat Flynn himself would share later, he wasn’t putting that together as a business. Instead, when he was laid off he thought to put together the notes he had when studied for the exam to create his first niche website: greenexamacademy.com. That is what passive income is about. In fact, a passive income business might take a great effort and investment of time and resources. Yet once it takes off, you need to be automating it at the point that the business can generate a stream of income with minimum effort and time. In other words, when Pat Flynn set up his first ebook for the LEED exam, he still had to make sure everything ran smoothly. However, 2-4 hours a month is nothing compared to a 9 to 5 job, which barely pays the bills. Going back to Pat Flynn story how did he go from $7.906.55 in October 2008 to $213.212.63 and over? Ever since the LEED exam, Pat Flynn’s online business grew steadily. There have been a few months where the growth picked up and accelerated. I looked at those months to see what projects fueled Smart Passive Income growth. The launch of my audio guide is what definitely boosted the numbers, and I did strike a few more private advertising deals on my website as well. What takeaways did he learn? To Increase Sales, Add a New Product. Have Someone Else Make The New Product For You. If You Sell Something To Someone, Make Sure You Can Contact Them Later On. Starting a Company and my CPA. In other words, once your online business starts to grow in revenue expand that content to other formats. Don’t invest your time to build the new product but outsource part of the work. Also make sure to start building an email list, so that one sale isn’t just that but it can become more than that. Another aspect is about making your business financially effective by consulting a CPA. In August 2010, Smart Passive Income revenues went above the $20K mark mainly thanks to affiliate marketing. In fact, affiliate earnings totaled $11.914.30 (a 110% increase compared to the previous year). I recommend products that I’m using and trust. That’s it! I go above and beyond to show how I use the products, and if people are interested in it, more than likely they will use my affiliate link to purchase that product too. I don’t force it on people, and simply offer it as a recommendation. It’s a win-win for everyone! The most important thing that happened in January (and the thing I’m most proud of too) is the Niche Site Coaching course that Tyrone and I began. LESSON 1: ALWAYS TRY SOMETHING NEW. LESSON 2: WORK ON WHAT MATTERS. LESSON 3: THE MORE YOU GIVE, THE MORE YOU GET BACK IN RETURN. The affiliate earnings (most of which come from SPI, but some come from specialized niche sites as well), are through the roof, but what I like the most is that my non-SPI earnings total over $13,000 (not including the client check), which is up from about $10k last month. What is Pat Flynn secret in generating all this revenue from affiliate marketing, even though he never used a sales lingo or tried to push anyone to buy anything? Learn and understand the needs and wants of your followers. Lead and teach by example. My most important rule for affiliate marketing is this: I only recommend products as an affiliate that I’m extremely very familiar with, and preferably products that I’ve used and have helped me achieve something. If I’m not confident in the product and I don’t feel it will positively help people, I will not promote it. I never directly tell anyone to buy a product. I always recommend products based on my experience and in the context of what I’ve done or what I’m doing. In fact, the first approach is based on benefits, but it isn’t personal. The second method is transparent, personal and meaningful. That is how you start building a successful affiliate marketing business. What page does Pat Flynn use the most to make affiliate earnings? My Resources Page: 20 referrals. Like I said, this is one of the most visited pages on my site. If you’re not utilizing a resource page for your niche on your site, I recommend that you do! It’s the ultimate non-aggressive way to earn money, leaving all parties happy in the end. Of course, an affiliate marketing business is possible if you have a right amount of traffic on your website and your resource page gets enough visits to make passive income. Just a quick example. Let’s say your site has 10.000 visitors per month. Only 1.000 visit the resource page, while 10 of them buy one of the affiliate products. Assuming you make $100 on each affiliate; you can make as much as $1.000 monthly from affiliate marketing income. In short, before it makes sense even to set up a resource page you want to make sure you have enough traffic and the right affiliations in place that can guarantee you a decent stream of income. For the first time, the earnings of Smart Passive Income go well above $100k per month! That is a million dollar yearly business! What did happen back then with that 79.35% growth? Even though affiliate earnings slightly slew down, there was a new business venture. This is definitely, by far, my best month ever! Breaking 6-figures in a month in gross revenue is incredible and something I never thought was possible. Of course, a major chunk of this income is a result of the launch of Breakthrough Blogging, but since enrollment is closed for now the numbers for next month should be back to normal. Says Pat Flynn in July 2013. In fact, back when he had launched Breakthrough Blogging which generated over $50K! You have to grow a thick skin. You must not forget about those who ARE pleased. They should be your primary focus. As we saw in July 2013, for the first time Smart Passive Income earnings went over 100k per month. However, that was due to a course he had launched which made Pat Flynn over $50K. It was only in March 2015 that Smart Passive Income organically reached, and passed the $100K mark. It was a record month! This is largely due to a special promotion I ran with Bluehost, and a couple of webinars I did with David Siteman Garland from SPI Podcast Session #136. What key lessons did he learn? Scarcity and the fear of missing out plays a huge role in your marketing success. I’ll be making a shift over the next two years from an affiliate-based income to one that is more diverse with my own products and courses. What key lessons learned in March 2017? if you have something of value to offer, and you truly believe in it, it’s your duty to sell so that people can understand that value and benefit from what you’ve created. That is where Pat Flynn journey reached the top at $321,642.86. Today Smart Passive Income isn’t any more a blog with affiliate links but an enterprise with a CEO, which focuses on creating info-products that create value for its audience. Smart Passive Income, in short, is a brand. Making money online isn’t easy. That might sound trivial. Yet it is not. Many new wannabe “digitalpreneurs” are fascinated by this shiny world. Pat Flynn’s story is compelling for a few reasons. First, building a real business takes time and a lot of effort. It shows that if you want to build an online business fast, you have to look at a real need people have. In fact, even before Pat Flynn was able to make money from affiliate marketing it took more than a year. Second, Pat Flynn started from an expertise he had. Since he was studying for the LEED exam, he used the materials he had put together to create a niche site to address precisely that audience. That is when he moved on and expanded in other areas. Third, it is about experimentation. From App development to WordPress plugins, online courses, public speaking, coaching and so on. Before you find your muse you might have to experiment quite a bit. That is what Pat Flynn has been doing, and that is why – I believe – he was so successful. Fourth, to make sales you don’t have to sell. As Pat Flynn’s and Smart Passive Income story showed, business is about trust. And you don’t get any if you don’t believe in what you’re doing. Also, when you’re the first who uses the product or service just showing how you benefited from them sell. Fifth, you don’t need a complicated sales scheme, but just a community that trusts you and a resource page. In fact, as Pat Flynn showed that is how he generates most of the earnings from affiliate products. That resource page is the central page of the site where most traffic lands. Sixth, what starts as a solo-project then naturally unfolds in an enterprise. After the first income report in October 2006, Pat Flynn in 2015/2016 shifted his mindset from a sort of solopreneur to the CEO of an organization. That might seem of no importance but it is a vital change. If you didn’t get it yet: the riches is in the niches! This article would be helpful if any specific examples were used. Hi Courtney, thanks for dropping the comment. This article was meant just to breakdown Pat Flynn business model. However, if you’re looking for business ideas, check this out: https://fourweekmba.com/business-ideas-with-low-investment-and-high-profit. Also, this one is more specific: https://fourweekmba.com/smart-passive-income-pat-flynn.